Anything But the Holidays, Stampin' Up! Hello stampers! This is a super fun style hop today, and this is my first “Outside the group” hop that I have ever done. I hope you like my design, it was fun to create. I always seem to look at the catalog in a different perspective, because I like my customers, downline and fellow stampers to get the most for their money with as many varied ideas as possible for a stamp set. I know a lot of people who simply do not purchase certain types of stamp sets, like Halloween or even Valentine’s Day for example because they feel they will never use them again. So I am happy to share this cute “Welcome to your new home ” card. I tried to set the “New Home” apart by lighting up the windows and shining a light on it! I also thought adding in Garden Green trees would give lots of depth and filing to this actually quite simple card. I cut several types of the houses, church and so on, and then layered them some flat, and some with Stampin’ Dimensionals to give much more of a “town on a hill” feeling. I would love to hear your ideas and thoughts on this cool card! 28. Tricia Butts – Tricia’s Stamping Creations U.S.A. Need a demo and live in the United States? Pick me, Pick me! 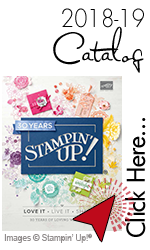 Rachthestamper.stampinup.net to Shop Now! Great card. Love how you used the stamps. Wonderful card for a welcome to your new home. I agree that no card is complete until it has some Wink of Stella! Love the way you have hightlighted the one house. Great idea!